Pionus parrots are one of the most underrated treasures found in aviculture today. They are medium sized, short tailed birds that hail from Central and South America. There are five species commonly found in the United States. Those are the blue headed (Pionus menstruus), white capped (P. senillis), Maxmilian (P. maxmiliani), dusky (P. fuscus) and bronze winged (P. chalcopterus). There are also coral-billed pionus (P. sordidus) but they are not as well established in aviculture as the other five species. Additionally, not yet known in the US are two other species, the plum crowned (P. tumultuosus) and the white headed (P. seniloides). Pionus have a distinctive flight, with deep, stiff wing beats whose movement remains mostly below the body. In captivity, these stocky birds are easily recognized by their trademark red vent feathers and noticeably notched upper mandibles. Pionus parrots do not have the overtly flashy coloring of many popular macaws and conures. They have subtle yet splendid coloring that is best appreciated in good lighting. These charming birds seem to have gained popularity in the last decade as more people are recognizing both their beauty and delightful qualities as companions. Pionus parrots as a whole tend to be more independent and less demanding of their owners than other parrots. They are often content to be in the same room with their human flock without a constant need to be held and cuddled. While their apparent lack of interest in being handled might be frustrating to a few, it is this independent nature that makes them ideal pets for many working owners. Pionus are not as loud as many other parrots. This is not to say pionus cannot get loud because they most certainly can; however, they don't seem to generate the decibels or the frequency that most other birds are known for. In addition, they are moderately good talkers. Pionus are not the most active birds but they do enjoy hanging, climbing and playing. They need cages that are at least wide enough for the bird to completely outstretch its wings and not touch the sides at all. Toys are a must. They like to chew and they enjoy such challenges as untying knots. In addition to the cage, play stands are perfect for entertaining your bird. Pionus tend to have good appetites, enjoy a varied diet and will usually easily adapt readily to new foods and diet changes. Fresh foods and sprouts can cause these birds to plunge head first into the food bowl and not come out until most of it is gone. Pionus are susceptible to the same diseases other parrots are such as PDD, polyoma, gout, infections, psittacosis and beak and feather disease. They are not prone to becoming neurotic or resort to feather plucking. They seem to be closely related to Amazons and they do tend to exhibit similar hormonal behaviors, especially the males, when they become sexually mature. Their body language can be easy to interpret so managing the hormonal pionus is not especially difficult. In another similarity to Amazons, pionus have a noticeable sweet, musky odor about them that most owners find quite endearing. And on the topic of endearing qualities, most pionus lovers will say that these birds have the most beautiful eyes of all the parrots. They are deep dark liquid brown, surrounded by a bare eye ring. 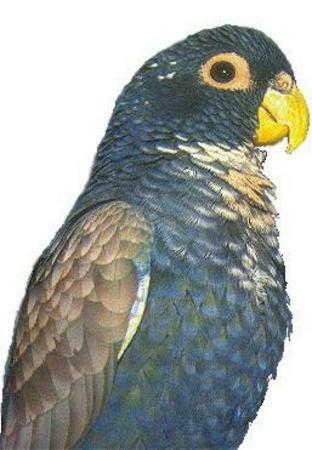 If you are considering adding a bird why not consider a pionus parrot. They are reasonably priced, not hard to locate and will provide you with excellent companionship for many years. Wow ang ganda!!! Meron kaya nyan dito sa Pinas?